Freshly stuffed salami—weighing around three kilos each—before being cured and sliced, at Tulip's Gøl sausage factory in Svenstrup, Denmark. 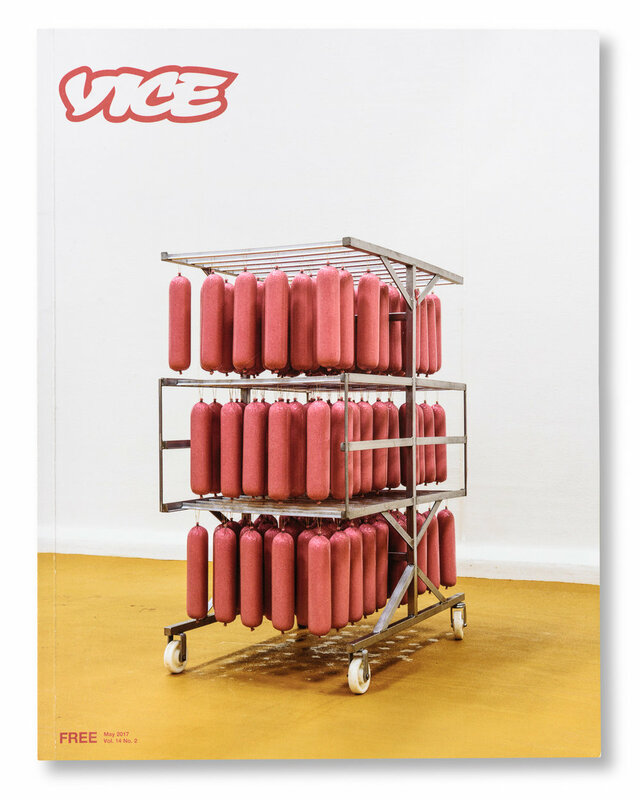 This series was shot for Vice Munchies. Among all the magical things in life—your first love, snow on Christmas Eve — there are few wonders greater than the Danish hotdog. But who knows what actually goes into that sausage which sits there in the sliced bun, all golden and grilled, snuggling up to remoulade, crispy onions, and pickled cucumber. Who really knows where their pølse (sausage) is conceived? Photographer Alastair Philip Wiper got rare access to Gøl's factory in Svenstrup outside Aalborg, where they have been making sausages since 1934. In this photo essay, Alastair follows every step of the factory procedures, from the cuts of meat being ground to a pulp, mixed with herbs and smoked over beechwood in one of Europe's largest smokers. Each oven can hold 84 racks, which equates to 25 tonnes of sausages. Today, Gøl is owned by the Tulip food company, but the plant in Svenstrup still makes sausages under the Gøl brand. And much more. If you take different shapes and spice blends into account, the factory produces more than 200 types of sausages, salami, pepperoni, and cold cuts for both retail and the catering industry. Forget the trailblazing New Nordic food movement; the pillars of Danish food culture—and fast food culture—are shaped out of this processed and congealed pork meat. But Denmark wasn't always synonymous with pork. The brand Tulip, which is the oldest registered trademark in the country (since 1909), was created as a nod to the Dutch. "In the beginning of the 20th century, bacon export was just coming along and Brits were the main consumers," says Michael Ravn, who is head of communications for Tulip. "And back in those days, Dutch bacon was regarded as some of the finest. So to tap into that recognition, the name and the brand Tulip was invented. To look and sound Dutch." These days, Tulip and Gøl are only happy to sound Danish and adapt their sausages and salami for international markets. "Our products end up as far away as Greenland and Puerto Rico," explains Ravn. "It's tough to sell pork meat in the Middle East, but we actually export to Lebanon as well." But the hot dog market can also be rife with cultural preferences and strong opinions—even close to home. The red sausage—a wiener whose casing is coloured with carmine, which once gave Campari its distinctive red hue—is a treasured staple in Danish hot dog stalls, but has been a harder sell in neighbouring countries. Sweden initially banned red sausages due to concerns over artificial colouring, although its appetite has increased since the mid-90s when producers switched to a natural colouring agent and the two countries' wiener-munching prime ministers leveraged some political pressure. In Germany the red sausage has been a hard sell. "A few years ago there was a taste test in Germany where they offered people on the street a sample of a red sausage and one sausage that was coloured green," explains Ravn. "Most people went for the green one. Danes would never do that. So you have to adapt to differences in each market, even if it's just south of border." At home in Denmark, the sausages being wheeled in and out of the smoke ovens and fridges on the factory floor in Svenstrup follow strict recipes. The wieners and red sausages are both made with pork meat and come in lamb casings, but the red ones are only smoked for a few minutes; frankfurters contain a small amount of beef and are stuffed in pork casings. Ravn is proud of the sausages, salami, and pepperoni slices leaving the factory. The coarser the mince, the fewer things you can camouflage as a producer, he says. "We like to show off our products because perhaps there are still a few urban legends or myths about this type of production. But manufacturers can't hide what's inside the sausage." "You can taste it and feel it. And we are proud of our sausages." Cuts of pork arrive fresh from the slaughterhouse. The cabinet in which the red sausages are dyed with carmine. The red liquid on the floor is excess dye. Machines that feed sausage meat into the casings are bering cleaned. Sausages on their way into the smoker. Blades used in the grinders are cleaned and sharpened. Pepperoni hanging in the curing room. Remnants of salami meat coloured with carmine. Pepperoni meat on its way to being stuffed into casings. Freshly stuffed pepperoni on its way to be smoked. Freshly sliced pepperoni on a conveyor belt. Sliced pepperoni on the way to packaging.